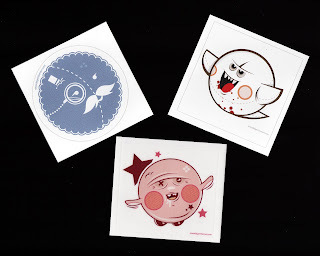 In an effort to thank me for mentioning him and his art on this blog on a few occasions, artist Dan Taub (aka 1oddgent) recently sent me a pack of stickers featuring some of his awesome creations. The subject of leftmost sticker in the image below isn't a character from a video game, although I could see him being one. (He'd seem especially at home in a brain-training or puzzle game, don't you think?) The subjects of the remaining two stickers, on the other hand, should be instantly recognizable--despite their somewhat abstract redesigns. For those of you who are scratching your heads: Boo from the Super Mario Bros. series is the subject of the sticker in the upper-right corner of the image above, while Kirby is the focus of the bottom-most sticker. 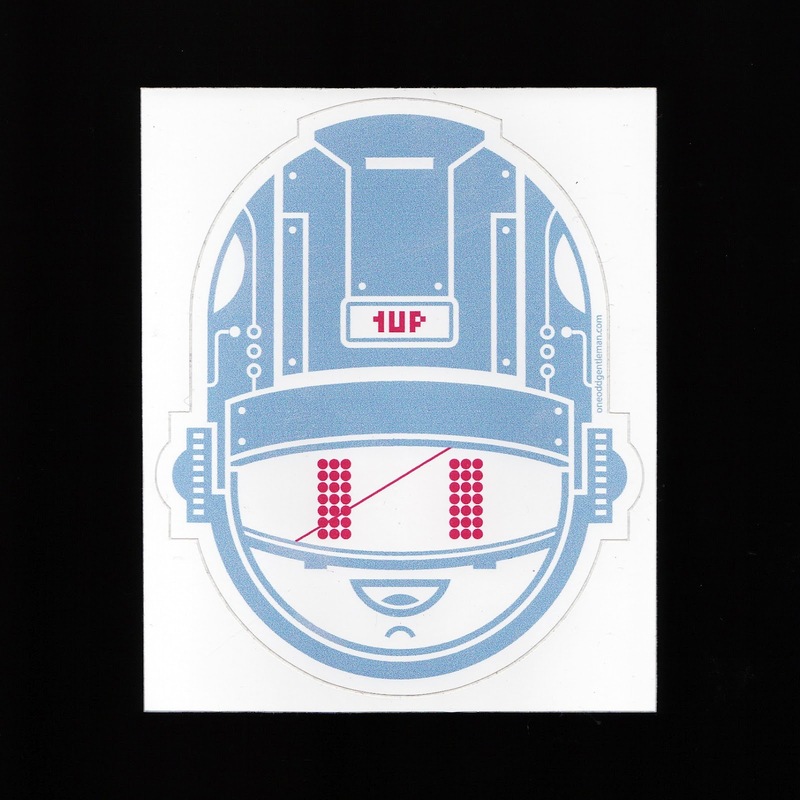 Taub also sent me the Tron-inspired sticker seen below. 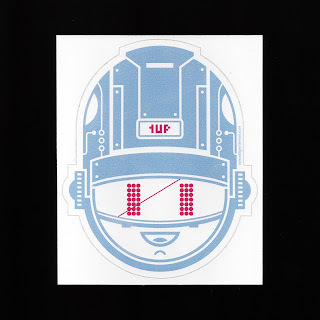 I especially like the pink "1UP" that's stamped on the gal's/guy's/thing's helmet. All of the stickers above have been printed on white vinyl sticker paper and are about three inches square. Well, except for the Tron-inspired one, which is about three-and-a-half inches by four-and-a-half inches. If you know a surface that's just begging to be plastered with a bunch of awesome stickers, hop on over to the 1oddgent etsy shop and pick up a pack or two (or three). That's it. For sure. I appreciate the artistic interpretation for its own sake, don't get me wrong. But that Kirby is definitely creepy. I hear you, Justin. No worries! I do think it's interesting that he decided to make Kirby rather ugly, though. Quite a change from Kirby's usual depictions! It's an unsettling Kirby no doubt, but I just looked at his etsy shop and plan on buying some Boo and maybe Kirby stickers. I like it - the cutest Nintendo characters filtered through a Dan Clowes aesthetic! Hey there, DavidR! Oh, yeah, there's a ton of great stuff in/on Dan's etsy shop. I especially like some of his framed stuff -- the Mr. Driller one and the Tanooki Mario one especially.